With Christmas fast approaching, we are offering this tin bauble shaped container with Peppermint Lindt Lindor ball chocolates and Lindt Milk Reindeers. These are a mixture of 11 Lindt Peppermint balls plus 3 Lindt milk chocolate reindeers. 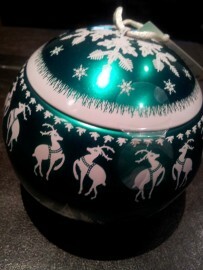 Baubles weigh approximately 155 grams. Sugar, Cocoa Mass, Vegetable fats, Cocoa Butter, Whole Milk Powder, milk fat, lactose, skim milk powder, emulsifier, peppermint oil, barley malt extract, vanilla seeds, flavouring.